Shazam Canceled, Black Adam Becomes Man of Steel 2 Villain? Does DC even know what it is doing anymore? There's one, and only one, thing that is very clear at this moment in time: Warner Bros. is definitely making some massive changes to their DC Extended Universe plans. But they are not giving up on it no matter what. A couple of years ago, the studio announced a huge slate of movies that would take us into 2020. Those plans seem to be more of a general guidelines at this point. At best. With movies being stalled or canceled outright, a new rumor has surfaced that the long discussed appearance of Dwayne "The Rock" Johnson as the villain Black Adam will not be in a Shazam! movie. Instead, he will be the main villain in Man of Steel 2. What does that mean for Shazam and the recently announced Black Adam movie? Nothing good, we can assure you. As sometimes happens, a leak of information about future DCEU projects made its way onto Reddit, which is where this rumor comes from. This happened earlier in the week as well with another leak that claimed Warner Bros. will be releasing four Batman related movies in 2019. The man or woman responsible for this new Man of Steel 2 leak would not reveal how they came across the information because they don't want to "jeopardize their position," which implies they are somehow connected to the goings on at Warner Bros. Here is what the mysterious source had to say about it. "Firstly, Black Adam will be the main villain in Man of Steel 2. The idea was tossed around of possibly making an appearance in the sequel, even if it was only brief. This later evolved into Adam becoming the villain due to the fact WB did not feel confident in the early drafts of the Shazam script and felt as if Dwayne Johnson deserved a bigger project (may be linked to how much they're paying him). Second, Matthew Vaughn is still talking to Warner about directing the film, however Warner are talking to other directors as well, which may be an attempt to increase pressure on Vaughn's agent." There is a lot going on there. For one, Dwayne Johnson has been attached to play Black Adam for a very long time now and in that time, his star power has grown significantly. So Warner Bros. is definitely going to have to shell out to get him in any of these movies. So why waste him as a villain in a movie with a character not nearly as many people care about? It actually makes sense to put him in Man of Steel 2 and Black Adam seems like a good opponent for Superman. You know, because he is insanely strong. This is something that was already teased not all that long ago last Christmas by The Rock and Henry Cavill on Instagram, with both of them having a drink and teasing their eventual meetup in the DCEU. "Merry Christmas and Happy New Year from Black Adam and Superman (@henrycavill). Today we drink like gentleman and come together as friends. We're excited for what the future brings.#DangerousGentlemen #DCWorldsWillCollide #BlackSavagery #MyExfoliatedBaldHeadAndTattoos #LookHellaSexyInThisLighting"
Also, the mysterious source mentions that Warner Bros. is checking out other directors for Man of Steel 2, but it looks like they still want Kingsman director Matthew Vaughn to helm the movie. So much so that they are apparently only looking at other directors to apply some pressure. For years, the plan has been for Dwayne Johnson to appear as Black Adam in a Shazam movie, but the other part of this leak states that probably won't be the case. In fact, according to this source, the movie is probably scrapped. "Lastly, some bad news, Shazam is practically off the table at this point. Warner did not feel confident in the first drafts of the script and is much more interested in Black Adam, as I said earlier. Despite this, it is likely that Billy Batson will appear in a film. To what degree? I don't know." 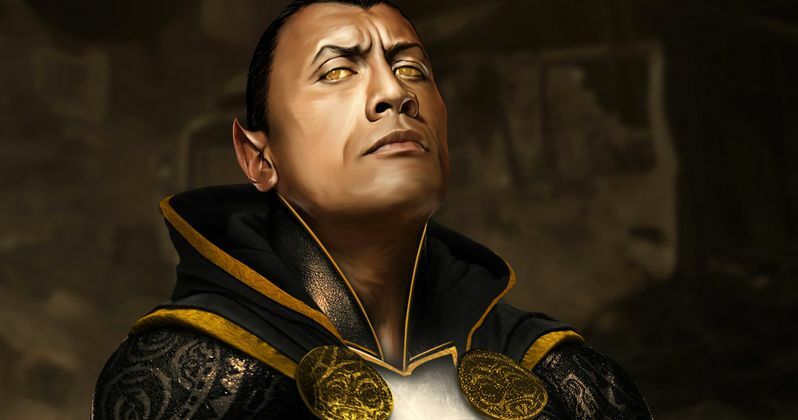 Not long ago The Rock announced that the plan was to do a Black Adam solo movie and a Shazam movie. If this leak is true, it is hard to know if that Black Adam movie will still happen before or after Man of Steel 2, but either way, it looks like Warner Bros. wants to keep Dwayne Johnson in the DCEU with or without a Shazam movie.